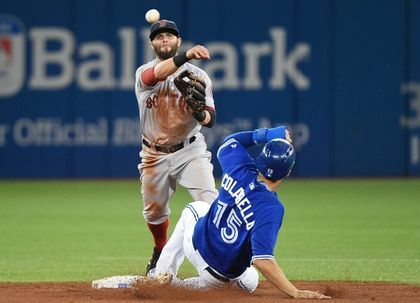 It was a late afternoon start at the Rogers Centre Saturday as the Jays were set to face the Red Sox in game two of the last series in Toronto. R.A. Dickey would be sent to the mound as Boston would send Wade Miley as his counterpart. The Jays were looking to remain steady with the Yankees who won their contest earlier on. Things would stay quiet during the first five innings as both clubs would get runners on base, but couldn’t produce on their attempts. Boston would get a run in first before Edwin Encarnacion would launch his 34th home run this season over the left field wall making it a 2-1 game. Boston would then tie it up in the seventh as Jackie Bradley Jr. would double scoring Brock Holt to tie it up. Heading into the eighth, the Jays would score two more runs making it 4-2. The boys in blue had their eyes set on winning their 86th game this season. However the boys in grey had other ideas. Boston would score five runs hitting off of Roberto Osuna and Aaron Sanchez. In the bottom of the ninth, with two outs, Matt Hague, would be up to the plate. The international league MVP would help the Jays with some momentum hitting a double on a sharp line to center field. Justin Smoak would follow at the plate, but not on the same level. He would ground out to end the ballgame. The Jays would lose a nail bitter 7-6 falling 85-63 on the year. Not a huge break on the record, but the club would see their ground on the second place Yankees fall to 3.5 games. They also stand 1.5 games back of the Kansas City Royals for first overall in the American League. The Toronto team will look to bounce back in the rubber match hoping for a Yankees loss to gain more ground back before facing the Bronx team for a three game set starting Monday night. Mark Buehrle will take the hill for the Jays as Rich Hill will start for the Red Sox. This will be just the second start for Hill this season as this is the first year he’s taken the mound in the past six. This is his third stint with Boston and is hoping to prove why he deserves to stay on the rotation when next season comes around. First pitch takes place at 1:07PM EST.